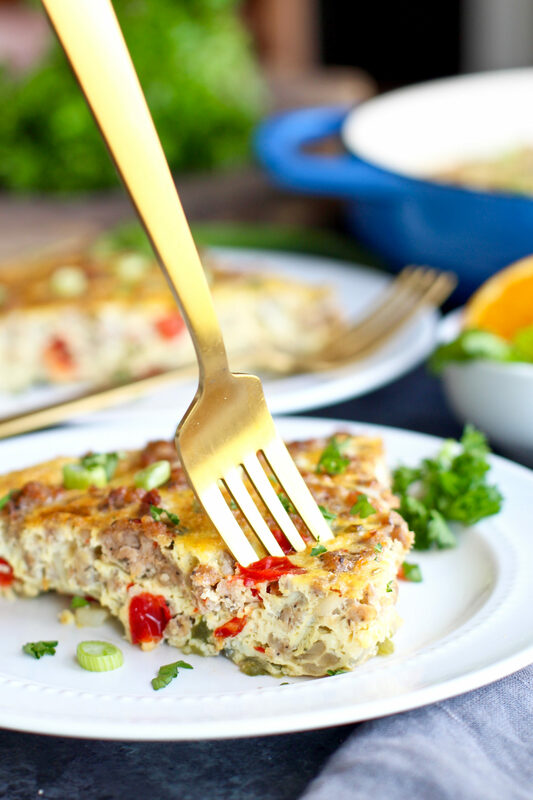 An easy and delicious Sausage Hash Brown Egg Bake made with less than 10 ingredients! It’s a dish the whole family will love! Serve it up for breakfast, brunch or even a weeknight dinner… because everyone loves breakfast for dinner! 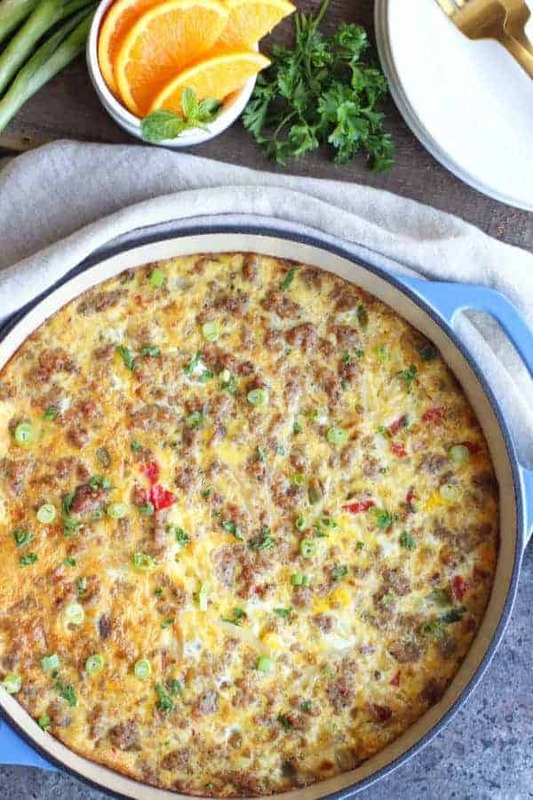 Every bite of this Sausage Hash Brown Egg Bake is complete with the perfect amount of spicy sausage, hash browns, and peppers. It makes for a perfect Sunday meal prep item. I love making a big egg bake on Sunday (like this one or my Sweet Potato Turkey Egg Bake) and reheating leftovers through out the week. This beautiful blue Lodge Enameled Cast Iron is one of my favorite pieces for everything from stovetop to oven (I also have it in red)! Love me an oh so easy recipe! With pre-made frozen shredded hash browns, our favorite squeaky clean pre-seasoned Pederson’s Farms Spicy Breakfast Sausage and I may have even purchased pre-diced peppers (I was in a time crunch #reallife), it really doesn’t get much easier than this. The recipe is quick to prep and in the over for just 30 minutes. 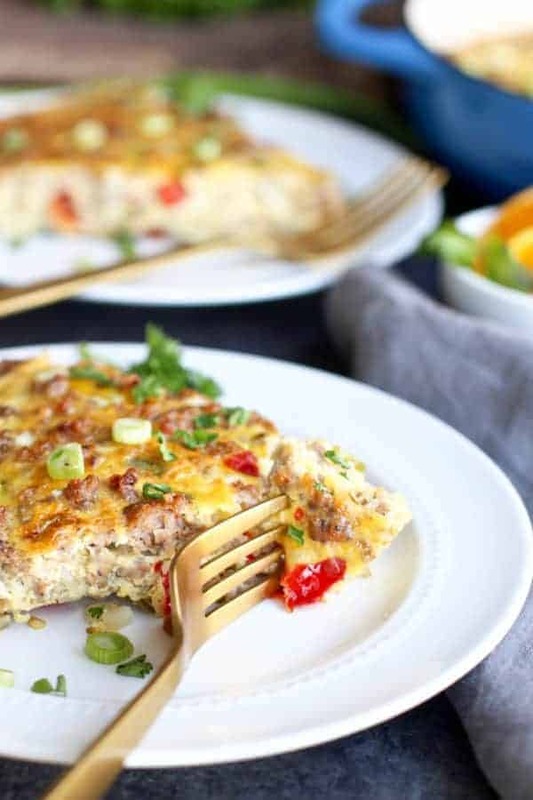 Sausage Hash Brown Egg Bake is indeed Whole30-friendly because of the omission of cheese! However, if you’re not Whole30’ing and want to add a little cheesiness factor, feel free to throw in a cup of your favorite shredded cheese into the mix. What I like to do when I’m on a Whole30 (which is usually just once a year) is make it without cheese and my hubby will add cheese to the top of his portion. That way it’s a win for us both. 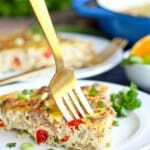 You can modify this recipe to fit your taste preferences or with whatever veggies or breakfast meat you have on hand. I’m all about saving trips to the grocery store, especially since the nearest grocery store to me is about 20 miles away so improvising and modifying recipes is a common practice in my house. 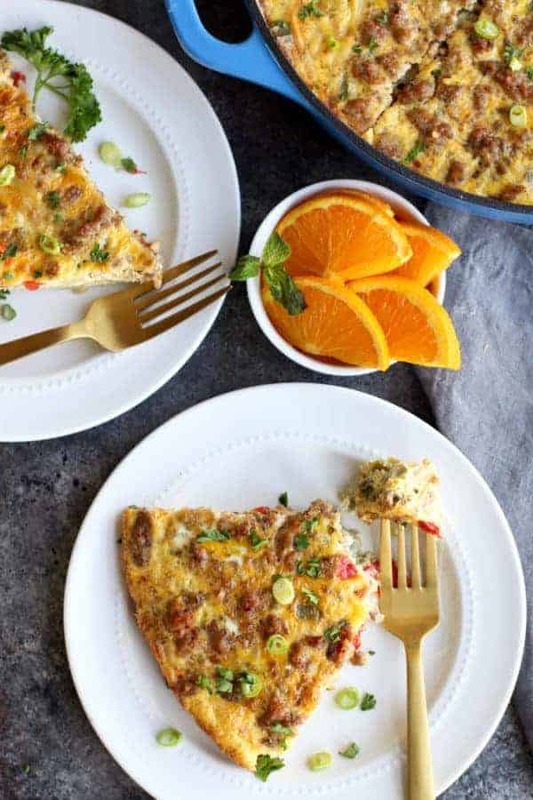 This Sausage Hash Brown Egg Bake can be made by using whatever veggies sound good to you, whatever breakfast meat you have tucked away in your freezer or you could sub shredded sweet potatoes for the hash browns. 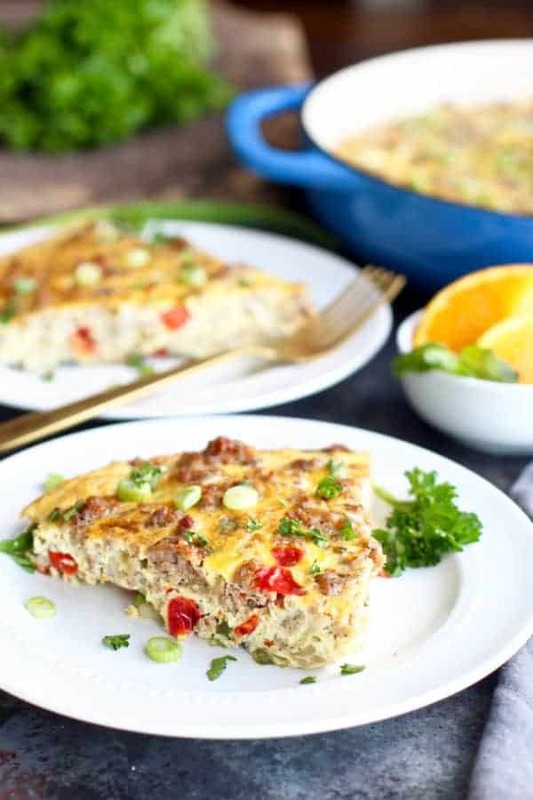 It’s time to start planning a fun and delicious brunch and invite some of your favorite people over to enjoy this Sausage Hash Brown Egg Bake. Serve it up with some fresh fruit and roasted asparagus to really round out the meal. 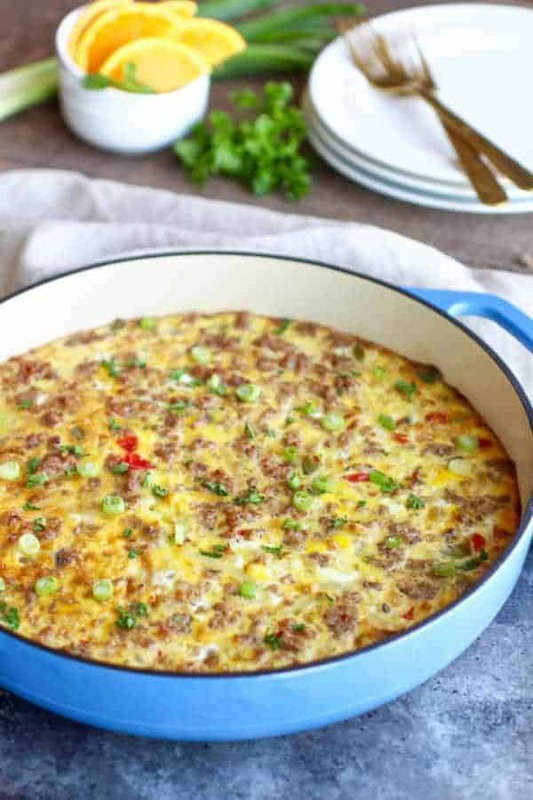 Overnight Sausage Hash Brown Egg Bake – simply prep it the night before, cover and place in the fridge and bake it up in the morning. Preheat oven to 350350℉. Grease a 9×13 or large casserole dish of similar size (such as the Lodge Stoneware shown in the photos). You can also prep the Egg Bake the night before you plan to serve it. Cover and place in the refrigerator overnight and bake it up in the morning. What hash browns do you recommend? I feel like a lot them have gunky ingredients. If you need to the dish to be strict Whole30 your best bet is to shred your own potatoes and freeze them. I shred mine using a box grater or food processor fitted with the shredder disk then spread them in a 1/2-inch thick layer on a parchment paper lined baking sheet then freeze them until solid. Once they’re frozen I break them up and transfer them to a zip-top bag to store in the freezer. I usually make a few pans to have them on hand for a Whole30. The Alexia brand does use Autolyzed Yeast Extract which, although not outlawed on Whole30, may be a grey area additive for some as it has been reported to have effects similar to MSG in some (this is anecdotal evidence, not research so please take that with a grain of salt). The Trader Joe’s frozen shredded hash browns are relatively clean though do contain dextrose (not Whole30-compliant) and they are not organic. So unless you make your own or find a brand local to you that I’ve not mentioned you’ll have to take into consideration whether or not they need to be complaint or not. I’m hoping others with more hash brown shopping savvy than me can also weigh in here. Wal-Mart sells shredded hashbrowns that are just potatoe’s. I think the brand is Dell’s. Yes, Mr. Dells is the brand of Hash Browns that I also buy! Cascadian Farms is another brand that makes Hash Browns that don’t have any added ingredients. I was curious if you think this would freeze well, and or how long it would last in the fridge once cooked. Thank you! I typically keep egg bakes in the fridge for 4 days. After that if there’s any leftover I wrap it up and pop it in the freezer. It does get a little ‘weepy’ when you thaw it and reheat it but it’s not a deal-breaker according to my egg bake-loving hubby. I used 93% lean organic ground beef instead of sausage. hope that is acceptable. I think that’s great! Hope you enjoyed it. Can coconut oil be substituted for ghee in most recipes? I don’t mind the taste in cooking, but my finicky daughter calls me out every time I use it. Somehow she can tell and won’t eat anything I cook with ghee. Can I freeze this egg bake? And for how long? yes, you may freeze the egg bake. I like to freeze it in individual portions for an easy reheat meal. I try to eat meals that I freeze within 3 months. They’re fine after 3 months but too long in the freezer may cause that freezer taste to come out. Just made this for breakfast this morning! Delicious! I can’t wait to make it on a Sunday to reheat during the week for a quick, healthy breakfast. I was wondering if you can recommend a compliant diced ham instead of sausage? My kids are not a fan of sausage, and they would love it if I used ham instead. Great to hear you like this recipe! We like Pedersons Ham which you can order from the Simple Grocer. Compliant ham is hard to come by but Pedersons is one that we like to order so that we have it on hand. Hoping to prep this tonight for the office’s breakfast tomorrow! Can you make this in a glass dish or does it have to be stone? Does it effect oven temperature? A glass dish would work too. You may need to adjust the time so just keep an eye on it. Does this heat up well after being baked and refrigerated? Have you tried doing half egg whites for this recipe? My meals tend to be heavy on the fat side so looking for a couple days to cut back. I make this recipe almost every week by the way, super delicious! I have not, but that should work just fine! Could I sub water for the non dairy milk or perhaps just omit the nondairy milk? Yes, you could substitute water for the non-dairy milk. So good! I want to save it for next week when I work an early shift! Does it freeze okay? Awesome! Yes, you can freeze-egg bake. I do quite often when I’m recipe testing.